Walmart’s high-profile effort to expand in Midtown has reached yet another snag, according to a report by Curbed Miami, a website about local Miami real estate. The 16,000-square-feet of retail would line the ground floor of one side of the Walmart store, providing a more interactive street front for pedestrians that maintains the character of the Midtown Miami project, CBS 4 news partner The Miami Herald reports. “This additional retail building would be a joint venture between Walmart and Midtown Opportunities, the developer that owns the majority of the undeveloped property at Midtown. Midtown Opportunities would develop the liner retail building and lease the property to retailers and restaurants. The plans were part of an amended permit application Walmart submitted to city staff for approval. Walmart’s redesign was intended to conform to the unique “urban character” of the community while incorporating the latest in contemporary design. The revision included more metal canopies, awnings, and a glass storefront. Zyscovich Architects, which created the master plan for Midtown, has been hired by Midtown Opportunities to design the retail space, which will have room for about four to six new restaurants and shops. 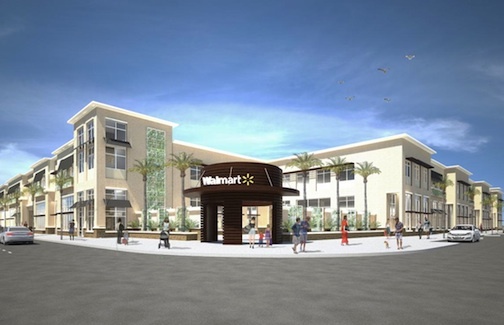 Walmart is hoping, to begin construction this summer, and is scheduled to open its store by 2014 – provided that it gets through this latest hurdle. Its willingness to push through with the project is likely a testament to the desirability of Midtown Commercial Real Estate. This news was brought to you by Metro 1 CRE, the leading provider of Miami Commercial Real Estate. For any commercial real estate needs, contact us at 305-571-9991.